Frigid Waters: What happens when it’s Freezing Cold? Cold-Stunned! The stars spinning in my head mixed with real ones in the heavens from my icy view on my back. I was maintaining the tractor driven aeration equipment used to keep the fish pond from completely freezing. My grease gun hit me in the face ice busting my lip when I slipped on the surrounding ice. My first thought as looked up, “They’ll find me here frozen in the morning”. Luckily I was only knocked out and shocked for a few seconds. I completed my task and went back to my safe warm house to recover. In the early 1990s, Mississippi boasted over 100,000 acres devoted to fish production, mostly catfish. Winter days on the catfish farm were memorable and brutal. During my initial interview, I was snowed-in for three days, the fish ponds froze over and workers had to use a sledgehammer to break ice to get the harvest net in the water. Cold weather is harsh on people and aquatic life too. The past few weeks reminds everyone just how tough it can be on land and in the water. Over a thousand sea turtles were taken from local waters to Gulf World and Gulf Specimen Marine Lab to recover from January’s extreme cold weather. Like other reptiles, a sea turtle’s internal temperature depends on the temperature outside. As outside winter temperatures drop, sea turtles can become slow and stressed to a critical point where turtles are vulnerable to pneumonia and other physical problems. The cold stunned sea turtles were triaged, treated, and gradually warmed up. Recovered turtles were successfully returned to the Gulf just a few weeks ago. 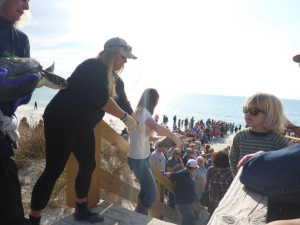 A line of volunteers pass and move recovered sea turtles from transport vehicles into the Gulf of Mexico at Cape San Blas. Freezing weather can also have a direct impact on seafood resources like oysters. In January 2014, shoreline portions of Apalachicola Bay froze covering some tidal oyster bars with ice. This resulted in direct loss of oysters and impacted the local seafood industry. This ice event added insult to injury as oystermen were already struggling with other issues hurting natural oyster production. The weather can wreak havoc for those that farm or make a living from fishing. Ice rafts in the shallow waters on the northeast side of the Apalachicola Bay causeway in 2014. Frigid weather can have direct and secondary impact to aquatic resources. In addition to direct impacts, secondary stress from cold weather can make aquatic species more susceptible to disease. Reports of sick or delayed mortality are observed days after the severe cold weather has passed. I’ve seen this several times while farming fish and in natural ecosystems. Disease organisms like bacteria have a preferred temperature window, which can cause more problems as temperatures warm entering the optimal range for growth. Keep an eye out for unusual problems as our typical weather returns and we are spending more time outdoors. Sick fish can be reported on-line or via telephone to FWC via the fish kill hotline. http://myfwc.com/FishKill or 800-636-0511. Sea Turtles and other wildlife issues can be reported at http://myfwc.com/contact or 888-404-FWCC (888-404-3922). Be sure to note your location, types and numbers of species observed. If you can make a report onsite you’ll be able to answer any other specific details that might be useful to responders and researchers. An Equal Opportunity Institution. UF/IFAS Extension, University of Florida, Institute of Food and Agricultural Sciences, Nick T. Place, dean for UF/IFAS Extension. Single copies of UF/IFAS Extension publications (excluding 4-H and youth publications) are available free to Florida residents from county UF/IFAS Extension offices. Scott Jackson serves our coastal residents, providing research based information related to artificial reefs, recreational fishing, shoreline restoration, and natural resources conservation. You can contact him by text or call 850-866-2300.